A day after losing in the IIHF World Championships semifinal to Finland, Team USA routed Canada 10-3 in the bronze medal game in Grand Forks. Clayton Keller had three assists, including a highlight-reel, spin-o-rama pass to Kieffer Bellows to give the U.S. a 3-1 lead. 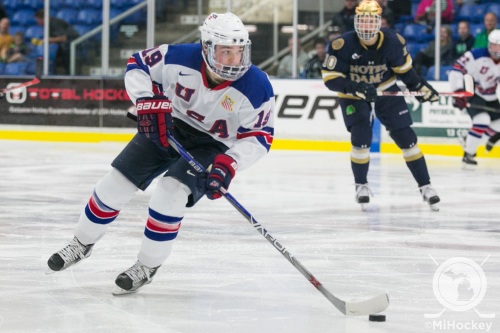 The goal was Bellows’ 50th of the season, making him only the fifth NTDP player to reach fifty in one campaign. Jake Oettinger turned aside 29 shots, including a penalty shot, to gain his fourth victory of the tournament. Keller finished the tournament with 14 points (4G, 10A), one behind leader Tyson Jost. He was named to the tournament all-star team and selected as MVP by accredited media. 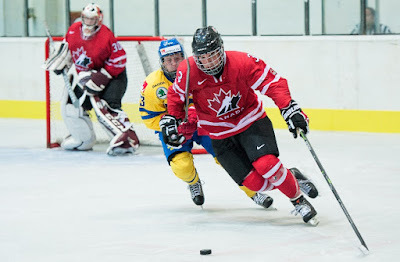 Keller was selected as one of the three top US players in the tournament, while Dante Fabbro earned similar honors for Canada. He was third in scoring among defensemen and third in assists with 8. Next season’s out-of-conference schedule is taking shape. BU opens the year at Colgate’s new rink, followed by a two-game series at Denver. Other opponents include Michigan, Quinnipiac, Yale, Harvard and Union. The Pittsburgh Penguins, with Mike Sullivan behind the bench and Nick Bonino anchoring the second line, advanced to the second round of the Stanley Cup playoffs, eliminating the Rangers in six games. Also advancing were Matt Nieto and San Jose, which ousted Los Angeles in five games. Charlie Coyle and the Minnesota Wild were eliminated by Dallas in six games. Kevin Shattenkirk and the Blues play a seventh game with Chicago tonight, while Colin Wilson and Nashville trail Anaheim, three games to two. 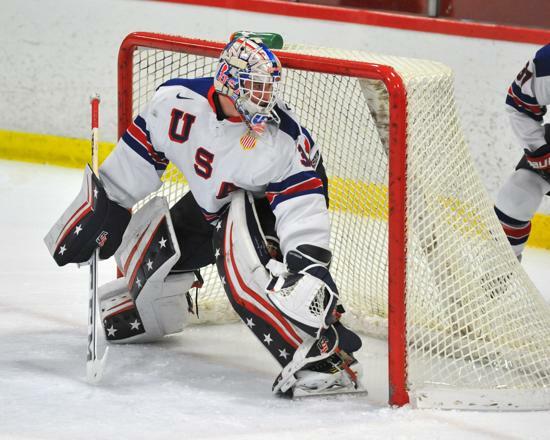 Team USA takes on Finland, while Canada faces Sweden in the semifinals of the IIHF World U18 Championships today. The US-Finland game airs live on the NHL Network at 4 p.m. ET. 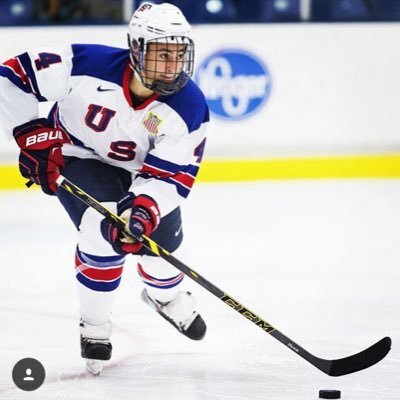 Five 2016 BU recruits will be in action: Clayton Keller, Kieffer Bellows, Chad Krys and Jake Oettinger for the US, and Dante Fabbro for team Canada. The championship game is set for Sunday. 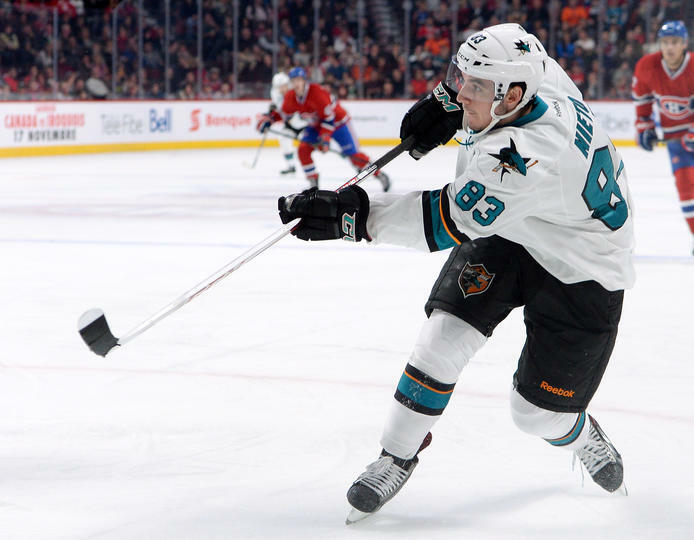 Matt Nieto scored his first playoff goal as the Sharks eliminated the Kings with a 6-3 win. The Boston Hockey Blog is reporting that junior Dillon Lawrence and freshman Erik Udahl have been cut from next season’s BU roster. Clayton Keller had three points (1G, 2A), Kieffer Bellows added an assist and Jake Oettinger stopped all 15 shots he faced as Team USA cruised into the IIHF World U18 Championship semi-finals with an 8-0 rout of The Czech Republic. Keller, who is second in the tournament in scoring with 10 points, was the U.S. player of the game. Oettinger improved his GAA to 1.00 and his save percentage to .942. Team USA will face Finland Saturday in the semifinals. Keller's three points give him 103 for the season, moving him past Patrick Kane into second place in the NTDP single-season record book. With two assists, he has 66 and holds the single-season record in that category, and, with one more goal, he'll tie Jack Eichel and Matthew Tkachuk for ninth most in a season. Dante Fabbro assisted on three goals as Team Canada raced past Swtizerland, 9-1, in a quarter-final game. The right-shot blueliner is tied for the tournament lead in assists with eight. Canada will face Sweden on Saturday in the other semifinal. 2016 recruit Chad Krys is the subject of profile stories from NHL.com and USA Hockey. BU has received a commitment from New Hampshire Junior Monarchs forward Matt Quercia. According the Heisenberg list, the 6-2, 185 lb., left-shot forward will join the Terriers' 2018 or 2019 recruit class. "Quercia is a dynamic player, who plays a heavy game and can really shoot it. The kid is clutch and scored some big goals. He's fun to watch, and he never gets intimidated. He never missed a step when he got called up to the big team." In 2014-15, Quercia scored 16 goals and 19 assists in 27 games for the Jr. Monarchs 16U USPHL squad. Drafted by the Quebec Remparts in the 2015 QMJHL draft, he briefly attended the Remparts’ training camp, before leaving to retain his college eligibility. USHR reports: "He's one of those guys who does everything well. He has good size, and is strong on his skates. Has power forward potential." ► Head Coach David Quinn joined the Daily Free Press’s Sarah Kirkpatrick to reflect on the 2015-16 season. 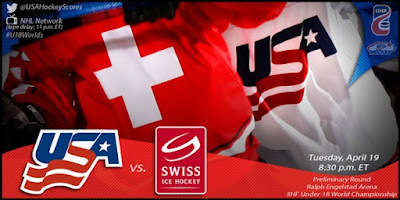 Following its 12-1 rout of Latvia, Team USA completes its preliminary round games at the IIHF World U18 Championships tonight, meeting Switzerland in an 8:30 p.m. ET start. The game will air on the NHL Network on a delayed basis at 11 p.m. ET.